Finding out you are having a baby is without a doubt one of life’s most exciting experiences – but it can also be overwhelming when you start thinking about everything you need to do before you welcome your bundle-of-joy into the world. Fear not, the Offspring Preparing for Baby Guide will help keep you on track. This is a very important job to tick off the list – after all, you cannot bring your baby home from hospital without a car restraint. Kidsafe advises children under six months must use an approved child restraint that is rearward facing. Capsules – Capsules are dedicated rearward facing child restraints. Many parents love them for their easy-of-use, and some brands offer a complete ‘travel system’, whereby the capsule can be moved from the car to a specially-designed pram, so you don’t have to disturb your baby when you are out-and-about. It should be noted that these capsules are only suitable from birth to about six months of age. Convertible Car seats – Convertible Car seats start off as rearward facing child restraints, then once baby’s shoulder reaches the appropriate marker, the car seat can be turned around as a forward facing seat. These are a handy and often economical option, because the one car seat can be suitable for your child from birth until they are around four years old, with car seats also available that are suitable from birth until eight years. Remember – It is not only important to have your baby in an approved restraint – it is imperative the car restraint is fitted correctly. Give yourself plenty of time to do this (you don’t want to be working out how to install the restraint in the hospital carpark). All car restrains will come with installation instructions but for peace-of-mind it is great idea to get pay a small fee to have your car seat properly installed and checked by an authorised fitter – some Kidsafe locations offer this service or can point you in the right direction. You might think you are buying a small car when you look at purchasing a pram. Indeed, there are many features to consider – and the price can also range drastically (with some prams costing thousands). 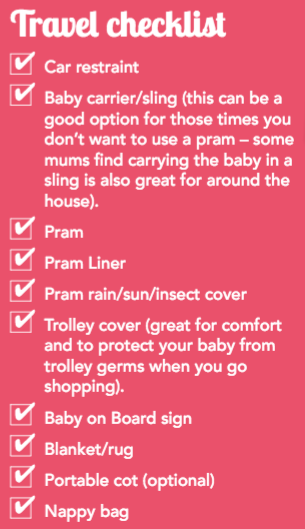 So, what do you want in a pram? It is important to consider how you will be using the pram before you go shopping. – Check that the pram you buy is suitable for newborns and that the pram meets Australian Standards. Like all baby equipment, safety is very important. Ensure that the pram has a five-point harness and tyre brakes. – Do you want to run/exercise with your pram? If so, check where you buy your pram that the tyres are going to be suitable. – Are you planning to use your pram mainly for getting around shopping centres? If so, a pram that features a basket underneath can be handy for storage. – Is this your second child – or are you expecting twins or planning on having children close together? If so, a double or twin pram might be the best option (or look at prams that have added options, such as a toddler seat/or skateboard attachment). – Remember some accessories can make a big difference! Buy a rain cover and sun cover just in case. Another great option, which can be just as much a fashion statement as a practical accessory, is a pram insert/cover, which makes the pram much easier to clean if needed. – How easy is the pram to fold down/put up? Try it out at the shops when you buy. – Size matters. Check that the folded pram will fit into your car boot. It is also important to consider the size of the pram depending on the intended purpose. If you mainly want your pram for when you go to the shops, it will not be a good choice to get a pram that is so wide it is difficult to fit down the aisles. – Consider features. Do you want a reversible handle so you have the choice of your baby facing towards you or away from you? This can be a handy feature if you want to face your baby away from sun glare or wind – or simple so you can look at your gorgeous baby as you push the pram! Goodbye tiny clutch or sleek handbag and hello nappy bag! Never fear, gone are the days of the ghastly bulky nappy bag (there are now a range of design options and some look like designer handbags). However, the baby bag is an essential item when you go out-and-about with your baby. – The style – yes, of course style is important! This bag will essentially replace your handbag so ensure you are happy with the look. However, remember that other people are likely to be using this bag too (for example, your partner or the grandparents). – Get two baby bags if possible. It is handy to have one to use and one that is packed and ready to go in the second car, ready for babysitters or just in case of last minute outings. – A baby bag that comes with a travel/inbuilt change mat is very handy. – Check that the bag is easy to clean – inside and out. – Ensure it has enough storage. You don’t want to overload your baby bag, but some easy-to-access pockets/zips can be a good feature. – Are you planning to formula feed? Many baby bags feature an insulated compartment for bottles. Once you have chosen your nappy bag include: a couple of outfit changes for baby, hat/beanie, bibs, nappies, wipes, hand sanitiser, scented nappy bag, age-appropriate toy, nappy rash cream, bottle/formula, dummy (optional) and a change of top for mum in case you are the one that ends up messy after a feed or nappy change. Changing nappies is something you do a lot when you have a newborn, so it is important to have everything you need to make this task a simple one. The first decision to make is if you want to put your baby in disposable or cloth nappies. – Disposable nappies are very convenient – no washing, drying or folding required. You can get nappies easily from most shopping centres and when it comes to change time; you just chuck out the dirty nappy and put a new one on your baby. Easy! – Modern cloth nappies are so easy to use. With either press studs or Velcro, they are easy to change (no sharp and fiddly nappy pins). They are also easy to take care of. You store the dirty nappies in a dry bucket (no soaking required), until cleaning time, when then they are simply washed in the washing machine. Disposable liners are available – giving you the option of simply flushing solid waste straight down the toilet. They are also suitable to wear at night – with boosters available for heavy night-time wetters. TIP: Even if you are planning on using MCNs for your baby, buy a packet of disposable nappies for the early days/weeks. Newborn babies can go through many nappies (and an infant first bowel movements, Meconium, is very sticky) so using disposables even for the first few days can be good option so you don’t have any extra washing while you are recovering from the birth. A bassinet is an ideal sleeping place for a baby in the early weeks/months. It is much smaller than a cot and if on wheels can easily be moved around the house during the day and then beside your bed at night. If you do not want to purchase a bassinet as it will be only be used for a short amount of time, bassinets can be hired. An alternative to the traditional bassinet or Moses basket is a ‘Baby Box’ from the Baby Box Company. This product stems from the tradition in Finland where mums-to-be were given a box of baby essentials. As well as housing clothes and accessories for the baby, the box that the goodies came in is used as a sleeping place for the baby (without the lid of course), with a fitted mattress making this specially designed box a very handy option. Note: Kidsafe recommends babies sleep in their own cot or bassinette in the same room as you for the first six to 12 months. Walk into a baby store and you could be overwhelmed by the number of cots to choose from – it’s not a simple choice between timber and white! Some cots may have clever storage options and drawers. Some may have the option of converting into a toddler bed or a day bed. It is important to ensure the cot you choose meets Australian Standards – and that the cot mattress is clean and fits snugly. Cot mattresses can vary in size – so check the measurements of your mattress before you buy sheets and then buy at least two sets – one for the cot and one in the wash. TIP: Safe sleeping: SIDS and Kids does not recommend using pillows, doonas, soft toys, cot bumpers or lambswools in the cot. An infant sleeping bag is a handy option – and ensures your baby stays covered (because they cannot kick it off) and without the need for blankets, it is a good way to ensure your baby’s head and face remain uncovered. It is important if you are using a baby sleeping bag that the correct size is chosen and the correct weight for the season, so your baby doesn’t overheat. Remember to buy a couple of good quality mattress protectors to protect the mattress in case of late night nappy leaks. A change table is not essential, but many parents find them handy. They are also a good height, especially for mothers who have had a C-section, because you do not have to bend over a bed or low surface to change the baby. If you don’t want a dedicated change table, you can get a change mat for on a set of drawers. Or portable baby baths that double as a changing facility are also handy. Regardless of whether you get a change table or not, it is important that everything you need to change your baby (nappies/wipes etc) is within reach and that the baby is never left unattended for any amount of time in case the baby falls. Storage is important for any room – and remember, your baby is going to grow! A tallboy is a good option for any bedroom (but remember to fix it to the wall to prevent it tipping over). A toy box is also a great addition to the nursery to store toys or even linen, but ensure it is a safe toy box, with soft-closing lid to prevent pinched fingers, so it is a safe addition to the room as your baby grows. Although, again not essential, a feeding chair is handy in the nursery for late night feeds and cuddles. You don’t have to have the baby’s room complete and perfect by the time they are born (many parents choose to keep the baby’s cot in the parents’ room for the first year), but the décor available is just irresistible!). A theme is a great way to bring a room together and looks very effective – but you don’t have to go overboard. You can introduce colour or animal/pattern theme simply by adding a few well-chosen key elements – perhaps some wall art, linen in your chosen colour/theme a floor rug or accessories on a shelf. Personalised options are a great addition to the baby’s room – and now with so many online options, no matter how unique your baby’s name is, you can order custom-made décor – from canvases to their name for the door. Kidsafe recommends babies sleep in their own cot or bassinette in the same room as you for the first six to 12 months. Are you breastfeeding or formula feeding? Your essentials will differ depending on the feeding option that is best for you and your baby. Breastfeeding is very convenient – the milk is always the right temperature and you can feed your baby anytime, anywhere. You may want to pump to express so your partner can feed the baby, so a babysitter can feed the baby if you are going out or to help relieve engorged or overfull breasts. There are various breast pumps to choose from (electric pumps are more expensive than manual pumps but are very effective and double pumps are available). Manual pumps are economical and can be a good option on-the-go. There are many formulas on the market, so talk to your health professional about how to choose the right option for your baby. A high chair is also an important feeding tool (but not something your newborn will need until they start solids, so this can be a later purchase). As with all other baby equipment, safety the most important feature. A great tip is for whatever highchair you are considering – imagine how easy it would be to clean if it was covered in spaghetti bolognaise. Always go for the easy-clean option. Depending on your feeding choice you will need bottles (don’t overstock on these before your baby is born – many babies take to certain bottles and teats so you may go through several brands before settling on one. If you are breastfeeding, consider breastmilk storage containers, so you can freeze expressed milk if needed. Storage cups or special freezer bags are available. When your baby is ready to start solids, stock up on baby bowls and spoons (there are spoons available that change colour if the food is too hot, which is a clever safety option). TIP: When your baby starts solids, invest in a ‘mess mat’ to go under the highchair. It will catch most of the food the baby drops, and will save you time cleaning the floor. Newborns don’t need a bath every day, but many parents like to give their baby a bath every night to make it part of a relaxing pre-bed routine. Baby baths are available; however you can bathe your baby in a sink or laundry trough. A water thermometer is essential (Kidsafe says 38°C is the recommended temperature for bathing young children). However, it is also important for a parent to check the water temperature as well as checking the thermometer to prevent accidental scolding. There is no need for fancy bathing products as newborns can be bathed in plain water, but again, some parents like using specific products to establish a familiar routine. It can be very easy to go overboard when it comes to buying baby clothes. However, remember this is a very popular gift item (so you are bound to get some from excited friends and family when your baby is born). Remember to choose something special to bring your new baby home from the hospital in. It is a very exciting day (and lots of photos will be taken) so definitely take a super-cute outfit to the hospital with you. Don’t forget another very important person to prepare for – the mum! 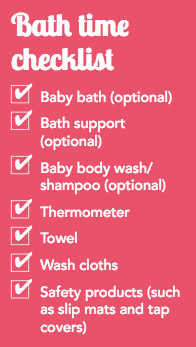 Ensure you have everything for the birth and your hospital stay. Maternity pads are must for the hospital bag – take a couple of packs. A packet of breast pads is also a good idea (even if you are not planning on breastfeeding, your breasts might leak after birth, so it is best to be prepared). Of course, you will need the usual basics including deodorant, lip balm, body wash, shampoo and conditioner, brush/comb and toothbrush and toothpaste. Remember some little luxuries, as they will help you feel a bit better when you are recovering from the birth. A rich hand cream or beautiful body wash can make you feel great. It is also important to pack appropriate clothes. Most of us will not walk out of the hospital looking like Kate Middleton after the birth of Princess Charlotte; you will still probably look like you are about five months pregnant. So leave the pre-pregnancy clothes at home and pack your trusty maternity clothes and comfy yoga or track pants. If you are planning to breastfeed, packing some nursing tops or a nightie that has buttons down the front for easy feeding is a good idea. Things ‘down there’ can be messy, so take comfy black underwear that you don’t mind throwing out afterwards. If you have a caesarean, ‘granny undies’ or full briefs are best; they sit higher so will not rub against your new and sensitive caesarean wound. Remember the bed socks! It can get cold in hospital, so take bed socks, comfy slippers or slip on shoes (note that your feet may swell after birth so take something comfy). A newborn baby certainly doesn’t look like they need copious amounts of toys, but there are some good basics to have as your newborn grows. Comforter – Many parents like to introduce a comforter/blankie (just ensure it is used under supervision and not in the cot/bassinet). Play mat – An easy-to-clean play mat is a good investment, which can be used from even the early days to encourage the all-important tummy time. Mobile – A colourful, musical mobile is great to encourage your baby’s interest. Place it above the change table to distract your baby at change time. Wrist and ankle rattles – These are great toys, which teach your baby about cause-and-effect (I shake my leg and the rattle makes a noise!). Books – Read to your baby from the earliest days. There are so many wonderful baby books – so start building a collection for your baby and make reading a book a part of your daily routine. Bouncer – You can get basic bouncers or top-of-the range, which include all the bells-and-whistles including calming vibrations and music. Your baby is tiny for about a second (it goes too quickly!) so ensure you create some keepsakes to remember this very special time. Photography – Many hospitals offer a photography service and this can be a great way to get some very special pics when your baby is so brand new. Another option is to hire a newborn photographer to do a photoshoot (ideally within your baby’s first two weeks). Photographs are such a special keepsake and can also be used to make birth announcement cards or to send to family and friends. Print kits – inkless print kits are available, which are handy to be able to take to the hospital. Capture your baby’s tiny, perfect finger prints, hand prints and footprints. You can then make them into a special canvas or put them in your baby’s record book. Baby record book – A baby record book is great to remember all of your baby’s important firsts and milestones. Remember to fill things out as they happen (because they do grow so quickly). 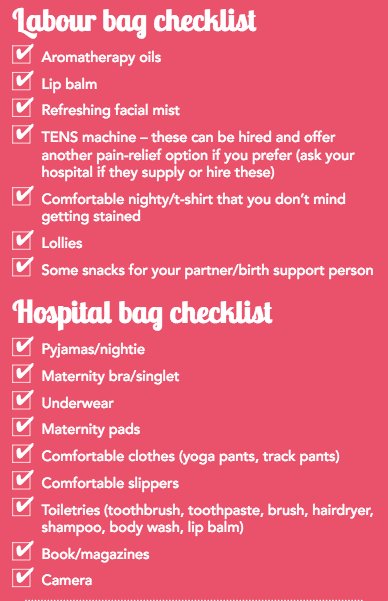 Before you go into hospital, organising a few things can make your homecoming less stressful. Food – Stock up the freezer so you and your partner can spend less time in the kitchen and more time gazing at your precious newborn. Make things that are nourishing, easy-to-reheat and that can be cooked in bulk, such as casseroles and hearty soups. Remember to also freeze some snacks (very handy when hungry strikes during late feeds), such as sausage rolls and fruit muffins. If budget allows, there are also various home delivery services, which deliver home-style meals to your door. Cleaning – When you are recovering (especially from a c-section) housework will be very low on the list of priorities. If you don’t have a partner or family close by to help, organising a reputable house cleaner (even just to do the floors and the bathrooms) is a good idea, if budget allows. Medicine cabinet – Ensure the medicine cabinet is stocked with the essentials to prevent late night dashes to the chemist. Include a digital thermometer, baby saline nasal drops and Baby Panadol (but ensure you check the age and dosage recommendations before use). Furry friends – Is your furry friend prepared for the arrival of your new baby? Preparations are best to start early (such as keeping pets out of the baby’s room or on the furniture). When the baby has been born, bring home a blanket the baby has been wrapped in so your dog gets familiar with the new scent is often recommended. Enlisting the help of some friends or a dog walker/pet sitter to take your dog on extra walks or give some extra attention during the early weeks is also a good idea. Siblings – A new baby can be a big adjustment for an older child, so make some preparations to help ease the change. Organising some special outings with friends or grandparents for your older child is a great idea when you are busy with the new baby. If you have a toddler, organising a box of quiet toys and activities (such as building blocks, books and arts and crafts) are handy to get out when you are feeding or settling your newborn.